Whether inviting a few friends over for a casual happy hour or hosting a party with an entire spread of hors d'oeuvres, a cheese plate is likely going to make the table as a popular choice among most crowds. Like fine wines, cheese – and more specifically, Brie – needs some preparation and thought to avoid a faux pas. With a few tips and some awareness, serving Brie cheese with a bottle of red wine can become an easy staple when entertaining guests. To eat the rind or leave it behind is a divisive question among cheese enthusiasts, but there is simply no conclusive, correct answer. Generally, people should follow their preference. However, it is good manners to take an entire serving of Brie, both rind and paste (the inside cheese), and leave the rind behind only on your own plate. An argument for eating the rind is that it provides complexity to the palate and also compliments the paste. Depending on personal preference, Brie can be served cold or warm. First is the drink accompaniment. 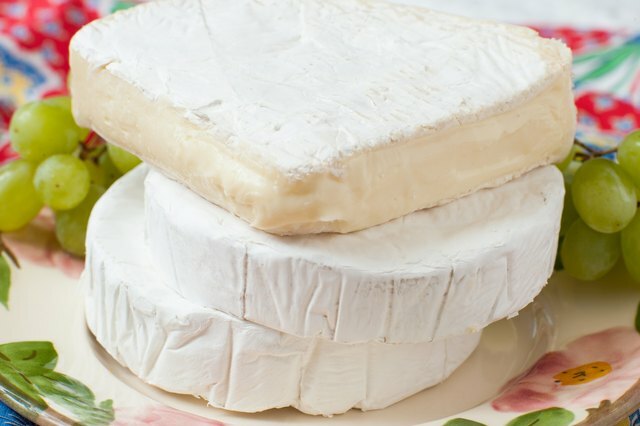 Brie should be served with a red wine such as a Cabernet Sauvignon, Merlot or Malbec. Round cheeses such as Brie should be cut like a cake in small triangular wedges roughly the width of a pencil. Occasionally, Brie is found in a rectangular shape. In this case, the cheese should be sliced straight across into squares of the same thickness. 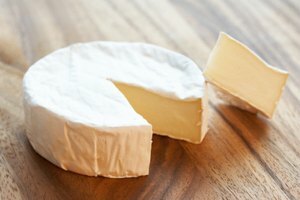 If other cheeses are being served, there should be a knife for each cheese or at least a way to wipe the knife between slicing cheeses so as not to cross contaminate. Finally, store leftovers in a cheese bag, which prevents the cheese from sweating. An alternative storage solution is to wrap the cheese in wax paper and then loosely cover the wax paper with plastic wrap. Cheese boards are all about balance of flavors and textures, so a mild, creamy cheese like Brie should be accompanied by a strong, hard cheese as well as a medium variety. 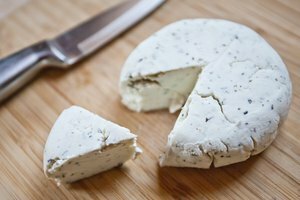 Try something like a sharp cheddar, a bleu cheese or even a goat cheese. Cheese boards should consist of an odd number of cheeses, typically three to five, with enough provided so that each guest receives 1 to 2 ounces of each type. Next, add an equal amount and variety of meats. Include another odd number of choices and select a variety such as hard salami, prosciutto and capocollo. To round out the salty, smokey and fatty flavors already on the plate, add pickled vegetables, fresh and dried fruits, sweet jams and crackers. There are endless possibilities for preparing and cooking a wheel of Brie cheese. Keeping in mind similar principles of building a cheese board, toppings for the Brie should compliment and balance the mild and creamy paste. Some recipes call for wrapping the wheel of Brie in pastry before baking, while others simply add ingredients as toppings. The Brie itself can be wrapped in aluminum foil for a meltier inside, placed in an iron skillet on its own and baked to create a caramelized topping or even sliced onto bread or dolloped into phyllo cups before being baked and melted in the oven. Popular sweet toppings include apples, figs, cranberries, orange, pomegranate and sugar that is bruléed in the oven. Savory toppings may include pistachios, garlic, mushrooms, herbs, pecans and walnuts. A combination of both sweet and savory ingredients baked with the cheese provides a balanced flavor profile by checking off the salty, sweet, fatty and acidic components to create a well-rounded dish. 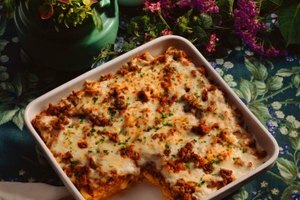 What Type of Cheese Should Be Used in Baked Spaghetti?